Renowned for their high quality acoustic ceiling and wall solutions, ROCKFON continue to push the boundaries of technology and are pleased to exhibit their latest innovations at the 2016 Surface Design Show. The company is also proud to announce they’ve been chosen as a Commercial Interior Surface finalist at the design awards and have been selected to feature at Surface Spotlight Live for Health + Wellbeing within the Surface Design Show. Highlights featured on Stand 154 at the show include: ROCKFON® Blanka™, the company’s whitest tile ever; the seamless monolithic ceiling ROCKFON® Mono® Acoustic; highly sound absorbent ROCKFON® VertiQ® wall absorbers; ROCKFON® Color-all® ceiling tiles and wall absorbers and ROCKFON® Eclipse® acoustic islands. ROCKFON has developed a durable matt ceiling tile that is visibly smoother and is the manufacturer’s whitest ceiling tile ever. Thanks to a special coating developed by the US space industry, the super white tiles have outstanding light reflection and light diffusion properties which optimise the uniform spread of natural light. The anti-static properties of the coating make the tile resistant to worksite dust and easy to wipe clean. The tiles’ smooth, non-directional surface allows for easy installation as they can be fitted in any direction, saving time and reducing waste. Recent durability tests rate ROCKFON Blanka top of its class. Smoother and whiter than ever before, new generation ROCKFON Mono Acoustic features an improved, seamless monolithic finish, fantastic acoustics and total design flexibility. 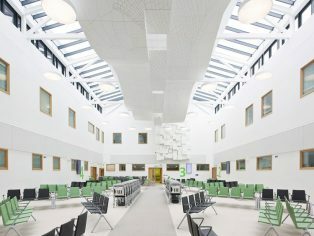 Available in white or bespoke colours, the system can be installed on either a suspension grid or directly mounted on existing ceilings and walls, whether flat, sloped or curved. A popular range of attractive wall absorbers, ROCKFON VertiQ enhance the acoustics in a space where a traditional suspended ceiling is not viable or where additional acoustic control is desired. ROCKFON VertiQ has a modern, a woven surface with a moiré structure. This tough finish ensures excellent impact resistance and durability, making these panels an ideal choice for areas that need to withstand above average wear and tear. Available in four contemporary colours they can be installed vertically or horizontally with no limit to wall dimensions, providing a highly versatile design solution. ROCKFON Color-all has a smooth, durable matt finish and is offered in two ranges. The Standard range of ceiling and walls tiles are available in 34 exclusive colours. If an exact colour match is required, ROCKFON Color-all Special ceiling and walls panels can be manufactured in an unlimited range of colours. 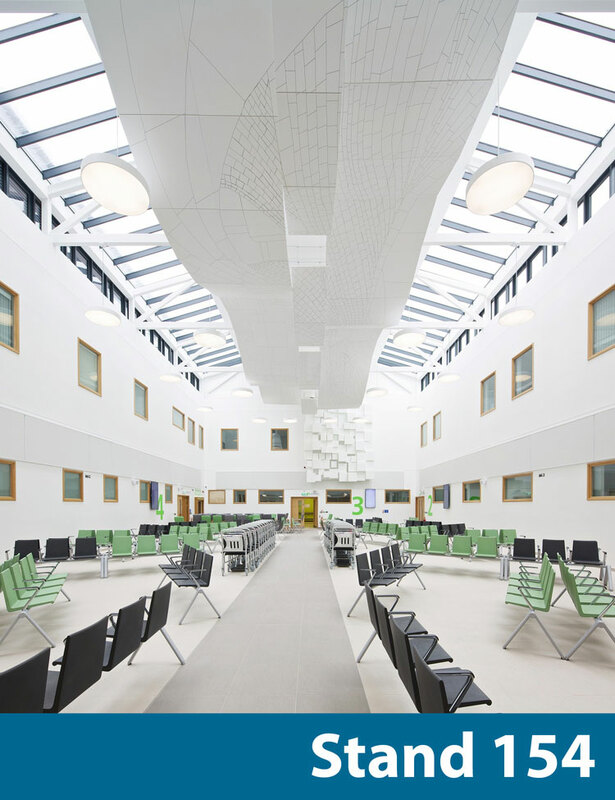 ROCKFON use the Natural Colour System® to enable the grid colour to match to the specified ceiling tile – offering the opportunity to create the most exacting design. These attractive, frameless acoustic islands offer excellent sound absorption performance and are available in square, round, other geometric shapes and custom formats for maximum design freedom. Choose from matt white or an unlimited number of custom colours from the Natural Color System®. ROCKFON Eclipse are quick and easy to install and can be fitted on their own or to provide additional sound control when a traditional suspended ceiling cannot be installed. They’re perfect for thermal mass installations as the air is able to circulate freely around the room. All ROCKFON ceiling and wall solutions are made from stone wool and provide excellent performance in terms of fire safety and humidity resistance. Their products are dimensionally stable at up to 100% relative humidity and can be installed in temperatures ranging from 0°C to 40°C allowing installation before windows are fully sealed, without risk of distortion. All products are backed with a 15 year guarantee and are fully recyclable. The ROCKFON team embody unrivalled expertise and knowledge when it comes to finding the perfect acoustic and aesthetic solutions for any interior design. They look forward to welcoming you to Stand 154, and to discussing how ROCKFON can help turn your design into a reality.